“Every year, nearly one million people die from suicide. More than 20 times as many people attempt it. The Next Day cites this statistic from the World Health Organization and explores the follow-up question through the eyes of four people. These four people—called Ryan, Jenn, Tina, and Chantal—indeed did not wait until that next day. They all attempted suicide, but lived. The Next Day tells us, and shows us, their stories. Any of these four could be a person the reader knows. 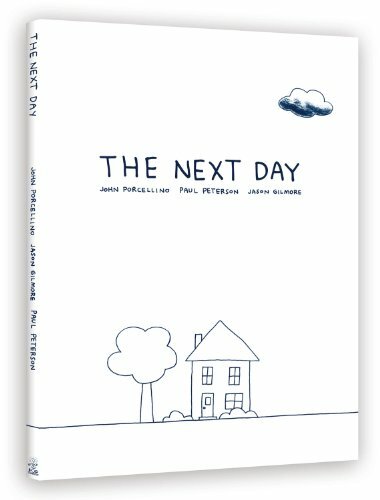 They are represented in this graphic novella in simple yet evocative line drawings. Each is at once unique, recognizable, and representative. All speak the words and tell the stories of the real individuals they portray. The Next Day tells the four individuals’ stories simultaneously. The novella begins with The Day of . . . in which we witness the suicide attempts. Their backstories unfold in several segments in The Days Before. . . . This section, the largest portion of the work, tells us the struggles each of the four has faced, yet also presents their relative ordinariness, their outward resemblance to everyday, normal people ypou and I would know and love. The book concludes with The Next Day . . . which examines the lives of each suicide attempt survivor moving forward to the time of project’s creation. The simplicity of the illustrations perfectly complement Ryan, Jenn, Tina, and Chantal’s forthright words. There is no clutter in The Next Day, no needless attempt to interpret thoughts, motivations, or consequences. In its simultaneous starkness and softness, illustrator Porcellino’s minimalism dovetails perfectly with the profound and honest words of the four subjects. Its stories and events portrayed are not novel or unfamiliar per se, but their presentation in The Next Day is original and unique. The graphic novella format alone is innovative, but that aspect comprises only part of a larger project. The book’s release will be followed shortly by an interactive online experience. The audience—or participants—will be able to select their own paths through the four stories—all while listening to the original audio interviews with the four subjects. Even without the promise of digital interactivity, The Next Day is a creative and worthy undertaking, a unique and powerful discussion of an issue that is at once growing in pervasiveness and intensely tragic and troubling.